Corporate functions can already feel a little heavy as they are. With everyone in their finest three-piece suit with the surly demeanour to match, the last thing you want is to add to the looming air of seriousness. But how can you possibly make a professional event less, well, professional? We recommend mixing things up with the event menu. While the crowd may be corporate, your finger foods should be anything but! We have a list of fine foods that’ll inspire your future food offering and take the edge off your corporate function. 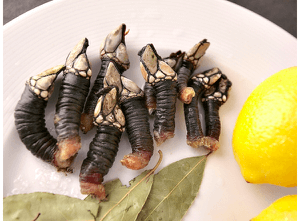 Here are our top 5 wildest finger foods from around the world. 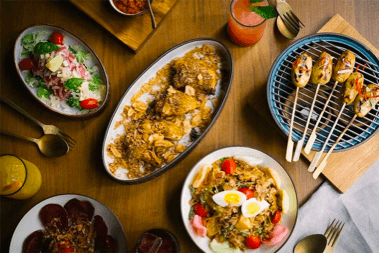 Anyone who’s anyone has definitely frequented this premiere dining establishment whenever they’re in Bali. Potato Head, not only offers world class acts on their dancefloor, but the menu of their zero-waste restaurant is the stuff of legend. One particular finger food that is a favourite amongst guests is their fish skin keropok, a cracker like snack made from sustainably sourced fish from across the archipelago. With the zero-waste movement on the rise the world over, treats like this show you just how environmentally conscious and sophisticated a finger food can be. Great for corporate types with a bit of a hidden hippie streak. While this may not look like the most attractive of edibles, it certainly is one of the finest seafood items you will ever taste. They grow on the rocky cliff faces that face crashing waves, making them difficult and dangerous to collect (and hence adding to their hefty price-tag). While they look like they were cut off an alien’s hand, rather than a cliff, the taste has been described as a mix between a lobster and a clam. A delight to seafood fans willing to try something new. 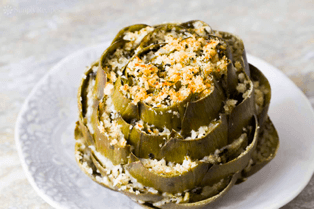 Moving away from oceanic marvels, we now come to the humble artichoke. While the scaled scallywag is starting to make its way into more culinary feats, it’s extremely popular in Mexico, where its prepared in the same way most Mexican cuisine is. Stuffed with cheese. No piece of edible real estate is wasted in this fibrous wonder. While most restaurants go straight for the heart, the Mexican recipe calls for a serving of melted cheese on each scale which can then be picked up and eaten whole. This is an incredible treat for vegetarians and meat eaters alike. It’s also easy to prepare and easy to enjoy without getting one’s hands messy, perfect for corporate functions. Nothing says fine foods like a bit of French finesse! Here’s where you’ve got to go with escargot, a unique genus of snail that is described as tasting and feeling like baked oysters. The real star of the show with this dish isn’t just the glorious shell, but the garlic butter sauce that accompanies it. A sprinkling of parsley on top adds an herbal air to the whole dish, keeping the flavours fresh and juicy. While this has been a staple in French cuisine for years, having it at a corporate function in Melbourne is a great way to show just how cultured your business is. 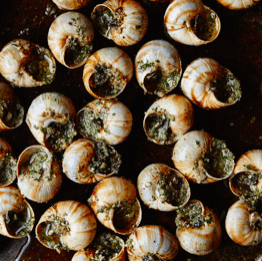 Be sure to have toothpicks on hand to remove the escargot from their shells, or alternatively, have them “shucked” before-hand. 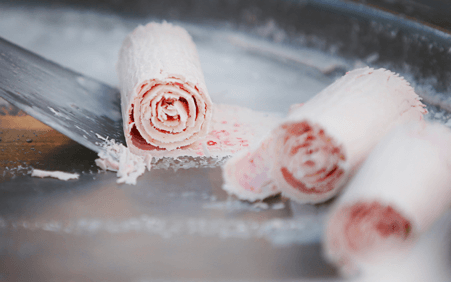 While this may arguably not be considered as a finger food, rolled ice cream a unique and enthralling treat than can be easily served and enjoyed in any corporate setting. The concept was birthed in South East Asia years ago, but it’s been used in ice-creamery’s the world over since. The process basically sees flavoured condensed milk spread thinly over a frozen metal surface and then rolled into tubes once the cream is fully frozen. Customers can have cookies, jam, chocolate, wafers (and pretty much any other sweet on offer) chopped and added to the mix, adding another dimension of flavour to the concoction. Not only is the experience customisable but it’s extremely entertaining, making it a hit feature at any event. When it comes to fabulous foods that add a new dimension to your corporate function, get in touch with our world class team for inspiration and execution. Our event curators have the expertise and experience to make your Melbourne event one to remember.